Here is the latest addition to our sewing machine collection. This is a Singer 201K, manufactured on September 10, 1952, at the Kilbowie Factory in Clydebank, Scotland. If you know a machine’s serial number, you can trace its heritage here on the Singer site. I’ve been wanting one of these machines for years, but they usually cost a small fortune. This time, I was lucky and just happened to be in the right place at the right time. The International Sewing Machine Collectors’ Society (ISMACS) says the Singer 201 “is considered by most collectors to be the best sewing machine Singer ever made.” They have an article about the Singer 201 with great photos and detailed information here. 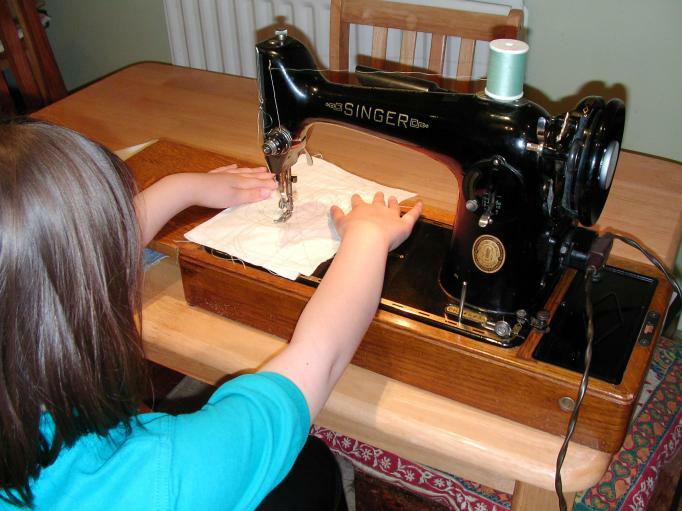 We like to name our sewing machines, and this one is called Peggy. She came with a foot pedal and mains lead (electric cord), a knee control lever, an extension table, and a lovely case. We picked her up last night. When my daughter got home from school today, she took Peggy for a test drive. My little one has just turned 8 years old, and she is already very interested in sewing. I’m pleased to see that she has been listening to my talks about sewing machine safety, and she is keeping her fingers well away from the needle. 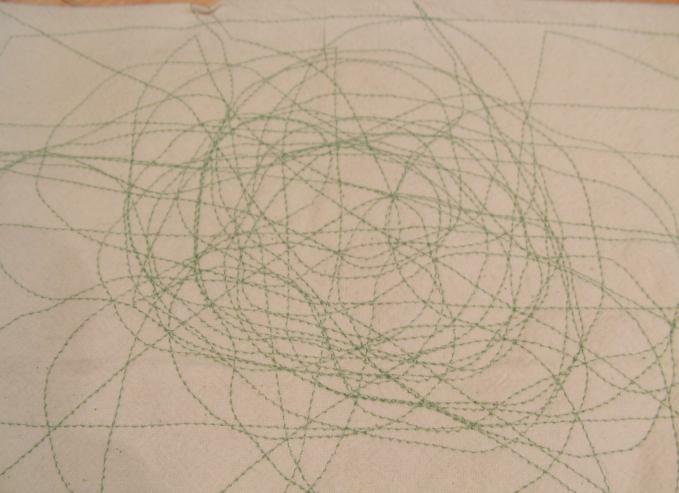 This is what she was working on. glad to see another machine collector. Although do I *technically* collect when I rotate and sew on several of them? I have a 201-2 that was bought new by DH’s grandmother, and still has the original cabinet, the original doodads in the drawers, even the original brochure! Hi, Alycia! I’ve always hoped that at least *one* of my girls would show an interest in sewing. I think this is the one! 🙂 Our school lets out for summer at the end of next week, and she is already making a list of things she wants to sew over the holidays. Can’t wait! Love the machine! Keep an eye open at car boot sales… hubby saw an old treddle singer being sold for £10 last week whilst he was having a peruse. Sadly, he wasn’t quick enough or I would have had it in my collection. And it looks like the sewing bug is being carried on. 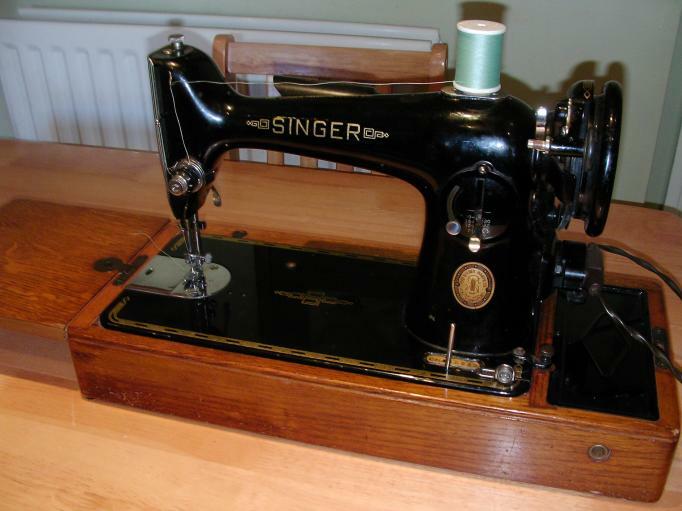 I have just been left my Great Grandmother’s singer machine, which is in a bit of a sorry state at the moment ( I think it’s from 1905) and made in Clydebank. I’m saving up and hopefully Molly will soon be sewing again. a 201–probably one of my favorite machines! I inherited one from DH’s grandmother–who had bought her’s new! Still in the original cabinet, with all the original attachments, even the original brochure with the prices written in, so I KNOW what they paid, in 1950! A 201 is a real workhorse, and the bobbin area is easy to access. The only thing I don’t like, is the bobbins do not hold as much thread as a 15 series–but that’s ok! That must be a fantastic machine, and so much history with it in one family! Was your machine electric to start with? Mine was made in 1952, but she started life as a hand-crank machine and was converted to electricity later on. Just found your site and was looking at your latest addition to your collection. I have one just like it, EG 398421 but on the badge it says 100 years of singer service. It’s in lovely condition and its still in its original case with all the bits that would have come with plus i have the bill of sale dated 1951. I’ve had a number of people asking if I’d part with it, but no one would offer a price. I’ve no idea what this machine would be worth if anything. To me It’s a lovely little machine which is a joy to use. I’ve just received my mother’s Singer which looks identical to the one at the top of this page. However, the only serial number I can find is on the motor. Is that what I should be looking at/for? Hi Jim, I believe this is correct: if your Singer sewing machine was manufactured in 1959 or before, the serial number should be on a small brass plate on the front right side of the machine. If it was manufactured in 1960 or later, the number should be imprinted into the bottom side of the metal frame. You will have to lift the machine up from its base or cabinet to see it. The youngest Singer I have is from 1975, and that is where her number is. I don’t know about machines made later than that. The serial number on the motor will only relate to the motor and not to the sewing machine itself. Have managed to track down the serial number and it turns out the machine was made in the Kilbowie factory in 1946. Apart from being a little grubby, it’s in excellent condition and complete with various attachments. My wife is excitedly looking forward to using it. Hello, thank you so much for your comment and for letting me know that I was helpful to you! 🙂 I hope you have many happy, creative hours with your new sewing machine!